-Demuestra interés, voluntad, autodisciplina y constancia en el mejoramiento de su desempeño escolar, evidenciándolo en la alta calidad de sus producciones escolares. - Identifica la energía como elemento vital para el ser humano y la reconoce en sus diferentes formas. - Reconoce y utiliza Power Point como el programa especializado en diseño de presentaciones y realiza algunas de manera sencilla. If we look around, we see that plants grow, animals move and the machines and tools perform different tasks. All of these activities have in common that they need the use of energy. 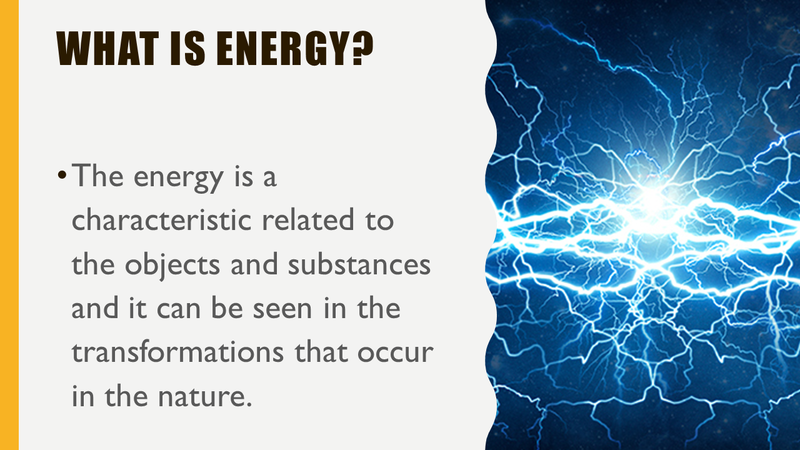 The energy is a characteristic related to the objects and substances and it can be seen in the transformations that occur in the nature. The energy manifests itself in the physic changes, for example, when an object is lifted, transported deformed or heated. The energy is also present in the chemical changes, like when you burn a piece of wood or in the water decomposition through the electric current. 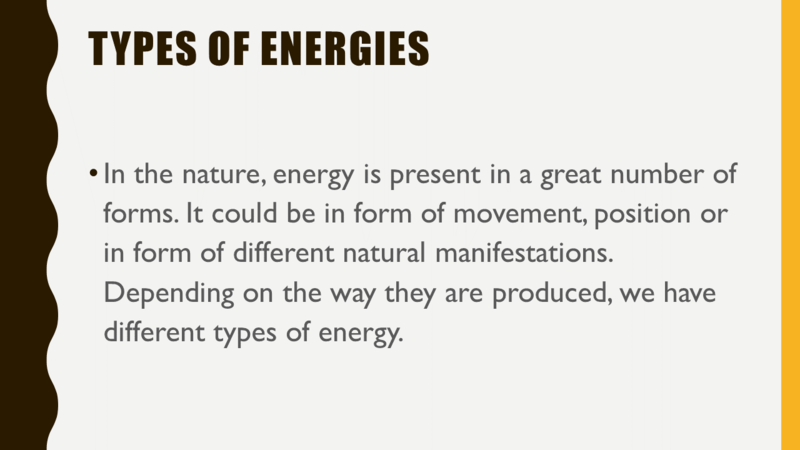 In the nature, energy is present in a great number of forms. It could be in form of movement, position or in form of different natural manifestations. 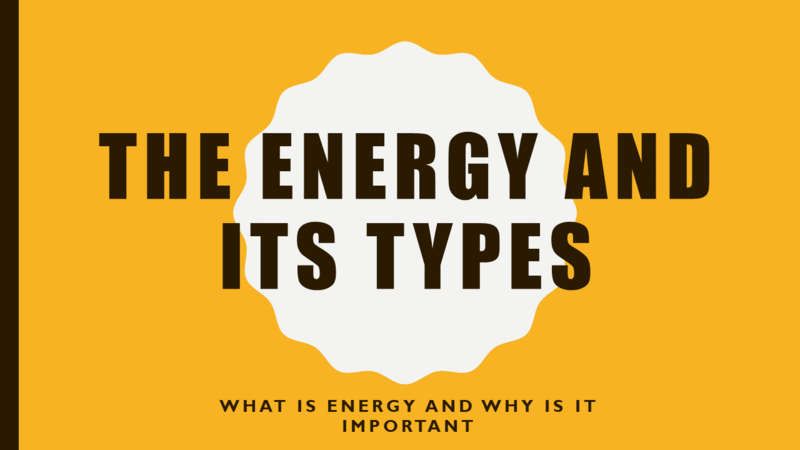 Depending on the way they are produced, we have different types of energy. 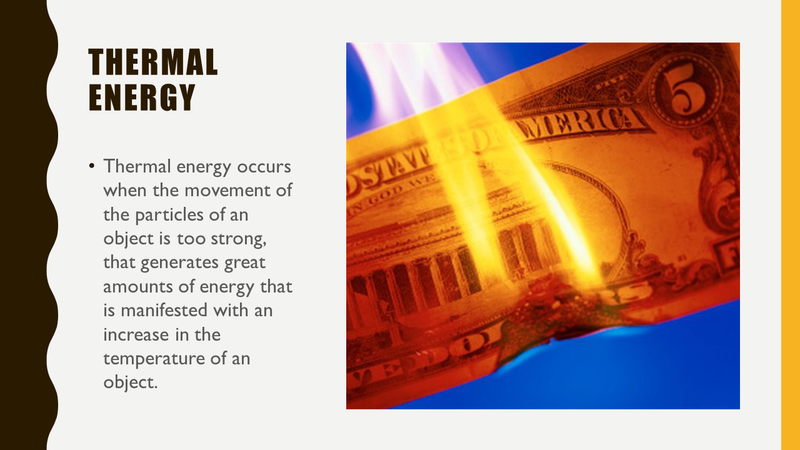 Thermal energy occurs when the movement of the particles of an object is too strong, that generates great amounts of energy that is manifested with an increase in the temperature of an object. 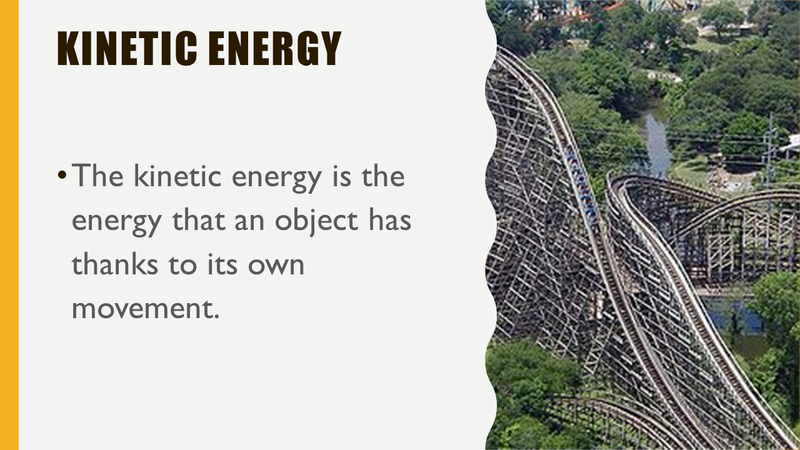 The kinetic energy is the energy that an object has thanks to its own movement. 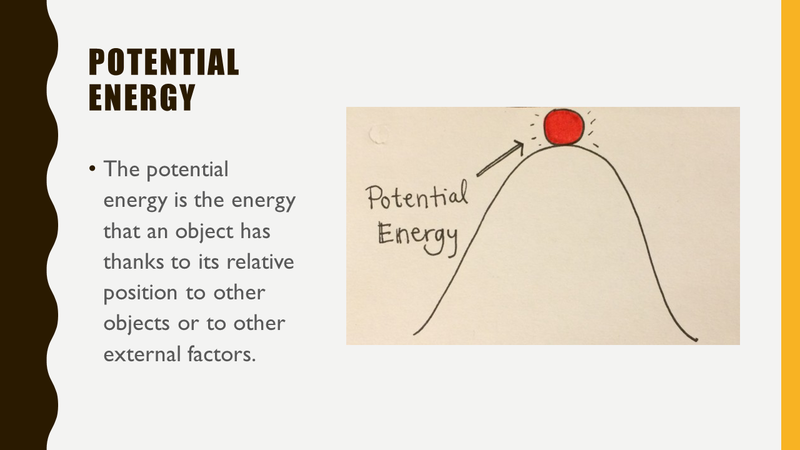 The potential energy is the energy that an object has thanks to its relative position to other objects or to other external factors. Everything needs energy to function. 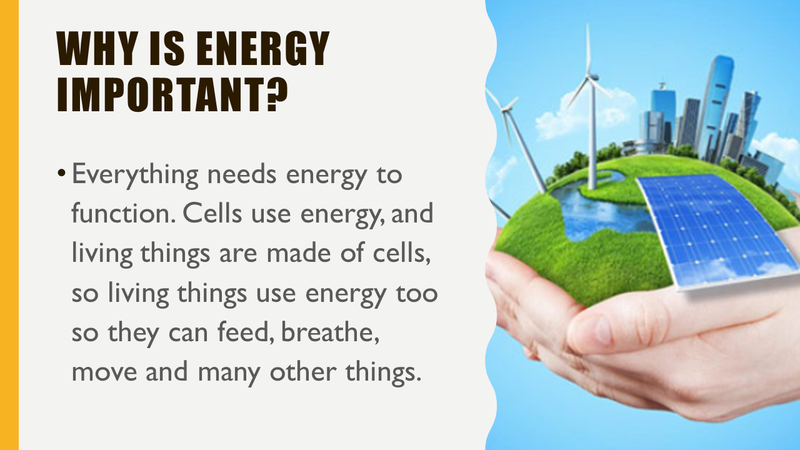 Cells use energy, and living things are made of cells, so living things use energy to so they can feed, breathe, move and many other things. Movement also depends on energy. All forms of transportation, from walking to flying in an airplane, require converting energy into movement. Because of this, energy is one of the most important parts of civilization. Watch these videos to understand more about what is energy and how it is present in our every day life. Download this workshop and bring it printed and solved in the week from November 13th to November 17th. This Workshop will count as an extra grade and will help you to rise the grade from the first quiz. PowerPoint is a slideshow presentation program that's part of the Microsoft office suite of tools. PowerPoint makes it easy to create, collaborate, and present your ideas in dynamic, visually compelling ways. If you failed the final exam, on the computers lab, you will download this workshop and solve it writing just the answers on your notebook.